What is Filorga Art Filler Universal? 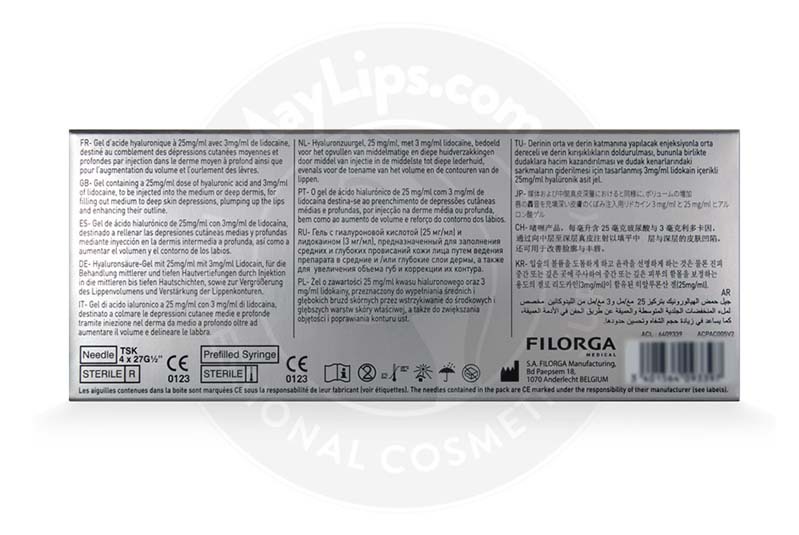 Filorga Art Filler Universal is a medical device made from non-animal hyaluronic acid and is intended to be used to correct moderate to severe wrinkles. An advanced manufacturing process, called Tri-Hyal Technology, is used to blend three forms of hyaluronic acid for a malleable and versatile gel. The concentration of hyaluronic acid and lidocaine are 25mg/mL and 3mg/mL respectively. 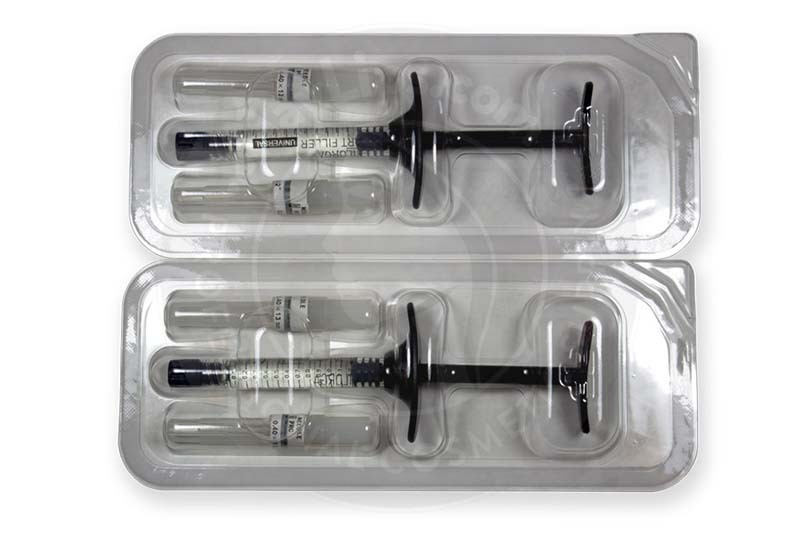 The filler gel itself is clear, transparent, viscoelastic, sterile, and free from pyrogens supplied in an effectively-designed syringe with a volume of 1.2mL. When you purchase a box of Filorga Art Filler Universal, you get 2 preloaded syringes, 4-27G single-use needles, labels to ensure traceability, and a product manual. This implant is part of the Filorga Art Filler range designed by Filorga, a French pharmaceutical company specialising in aesthetic products. Patients suffering from medium to deep wrinkles will respond well to Filorga Art Filler Universal injections. Lip and face volume can also be enhanced using this dermal injectable. Wrinkles and lines happen when the normal skin structure is affected by a combination of intrinsic and extrinsic ageing. Intrinsic ageing simply refers to the unavoidable biological ageing regulated by genetics. It causes a decrease in the overall function of many skin cells, like collagen and hyaluronic acid. Some people are bestowed with good genes that preserve skin health for a longer time compared to others. However, intrinsic ageing is marked by the appearance of fine lines on dehydrated, dull and weakened skin. On the other hand, external skin-harming agents like excessive sun, smoking, poor diet and pollution are considered extrinsic factors. These factors introduce plenty of free-radicals, which worsen the already weakened skin. As a result, skin depressions tend to deepen in areas where facial expressions frequently occur. Over the years, hyaluronic acid has been extensively studied due to its superior skincare, cosmetic, and pharmaceutical benefits. It is actually an intricate sugar substance found naturally in the human body. Besides providing nourishment, hyaluronic acid effectively moisturises skin. Filorga Art Filler Universal is hyaluronic acid-based injectable filler has been expertly designed to fill any skin depressions while boosting collagen production in the long run. Tri-Hyal Technology is innovative for it combines 3 varieties of hyaluronic acid. Ratio of Very Long Hyaluronic Acid Chains vs. Long Hyaluronic Acid Chains: Universal Filler has moderate ratio of long hyaluronic acid chains. 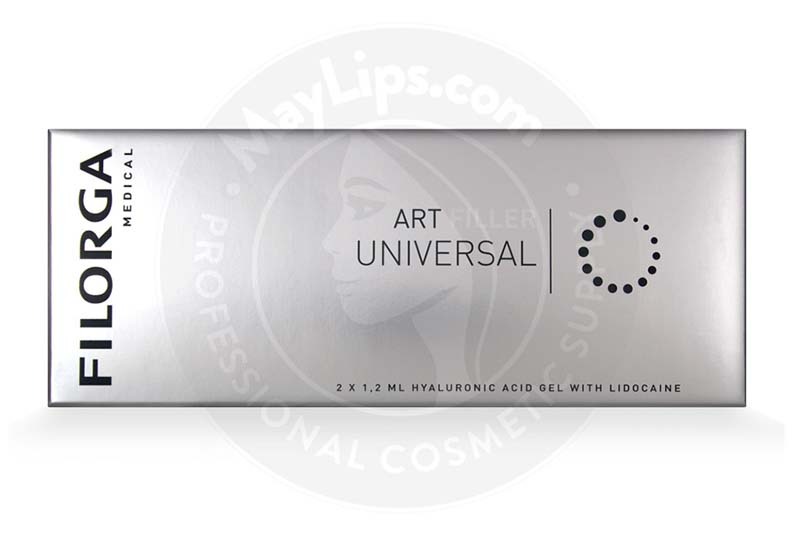 Cross-Linked Hyaluronic Acid: Universal Filler is packed with a considerably high amount of cross-linked hyaluronic acid molecules. Free Hyaluronic Acid: Universal Filler contains a considerably high amount of freely-existing hyaluronic acid molecules. Consequently, the implant has an easy-to-shape texture with good filling potential. Once injected, the gel can be easily moulded to fill wrinkles and integrate into tissues seamlessly for polished results. In addition, innovative technology is even carried over to the syringe design. It is ergonomically-designed to have a comfortable finger grip, rigid plunger and spacious thumb rest. There is also an integrated Luer lock to ensure secure needle attachment. Hence, physicians are able to conduct injections accurately. 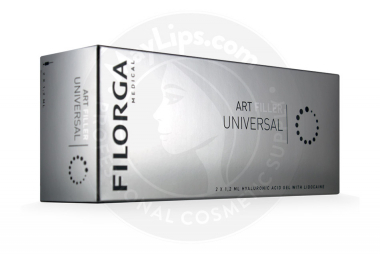 Filorga Art Filler Universal should be injected into the mid or deep layer of the skin, depending on the severity of wrinkles. Physicians may use retro-tracing or bolus injection techniques. Please note that dermal filler treatments are a medical procedure and must be conducted under strict aseptic techniques by legally certified and experienced medical practitioners. Filorga Art Filler Universal is renowned for its long-lasting yet tissue-friendly performance. Long-term studies have found that the implant can safely provide corrective actions for up to 18 months, after which it is slowly absorbed into nearby tissues. No inflammatory nodules were observed during that period. In addition, injected filler gel also boosts existing collagen creation (neocollagenesis). So, wrinkles are filled in and skin structure is improved. Patients can opt for more filler administration once the effects diminish. These studies found that there was still an improvement after 12 months without a touch up. The duration of effects will vary per patient. Who are prone to developing keloid/raised scars. Clients who are pregnant or breastfeeding should also avoid this device. Read the package insert carefully for a complete list of warnings. Your clients might experience some localised inflammatory responses on the injected areas. These reactions typically appear soon after the treatment sessions and will subside within a week. However, patients should get quick medical attention if the symptoms last longer than a week or become worse. Read the package insert carefully for a complete list of adverse reactions.